If you have been wanting to get a bakeware set, here is a pretty nice deal to check out. 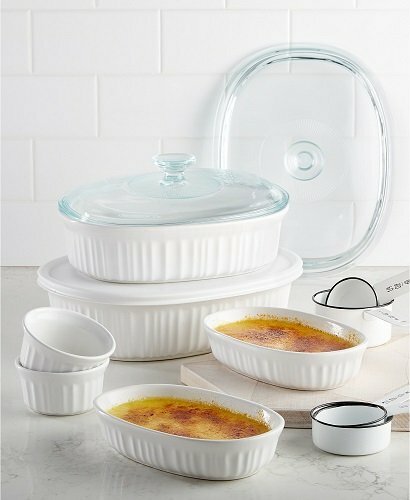 Macy’s has this Corningware French White 10 Piece Bakeware Set for $19.99, down from the normal price of $79.99. It is on sale for $29.99, but if you look just under the price, there is a $10 mail-in rebate to submit for. (rebate was only available through 2/5). The promo code did not work for me. It looks like the rebate was only available through yesterday, when the post was published. We have added that info to the post to prevent confusion moving forward. Thank you for bringing that to our attention! We will let folks on FB know too. Thanks again! !